My new Schacht wheel has a nifty accessory available. It’s called a bulky/plyer flyer. It has a larger orifice to accommodate thicker yarns, and a larger bobbin that holds a considerable amount of yarn. I don’t have a lot of interest in bulky or art yarns at the time, but I do like the larger capacity bobbin for plying yarns. If I have three bobbins full of singles, and want to ply them together into one-three ply yarn, it’s not all going to fit on one bobbin. I also like to make my end and selvage cords for Navajo weaving – this should be easier with a larger orifice and bobbin. To use the flyer, I have to remove the old one, and that’s no problem, I have to do that whenever I change the whorl or bobbin. I also have to remove the front maiden . This means removing or nearly removing the tensioning screw that holds it in place. It gives me a chance to get some wax on wood that is otherwise hidden, and some oil in harder to reach places. The instructions clearly state that it works better with scotch tension. I learned to spin with a scotch tension, but once I started using double drive, I never looked back. I initially decided to stick with double drive, since it will work with it, but quickly realized that I need a longer drive band because the larger flyer won’t turn – it’s too low. 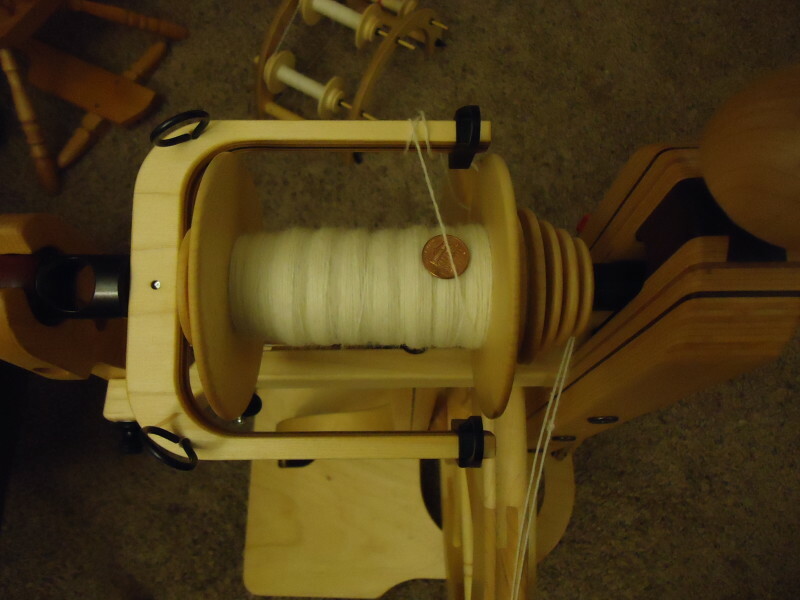 So I turn the bobbin around for Scotch tension, double the drive band and place it on one whorl groove, and set up the scotch tension cord. Oh yes!!! Now I remember why I never went back to scotch tension, adjust-adjust-adjust. When the bobbin gets some weight, adjust some more. Just tiny increments, but you need them. The manufacturer recommends doubling the drive band for scotch tension, but my drive band (now doubled) would turn at a different rate. One strand would travel faster than the other. One would lag enough that it would droop, and at times jump track onto the other whorl groove. I’m certain this isn’t supposed to happen. 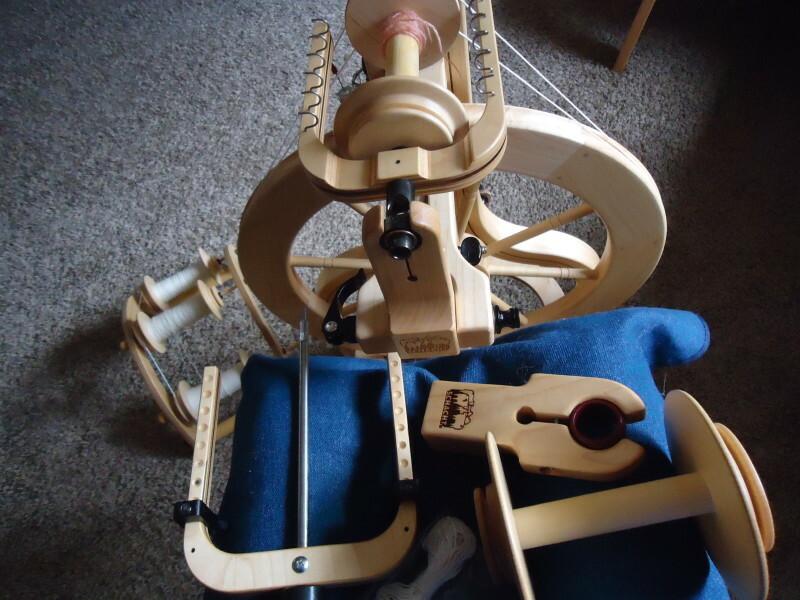 I plan to contact the manufacturer and ask about the best way to use it in double drive, and if I should just have a separate drive band for the plying flyer regardless of the tension. 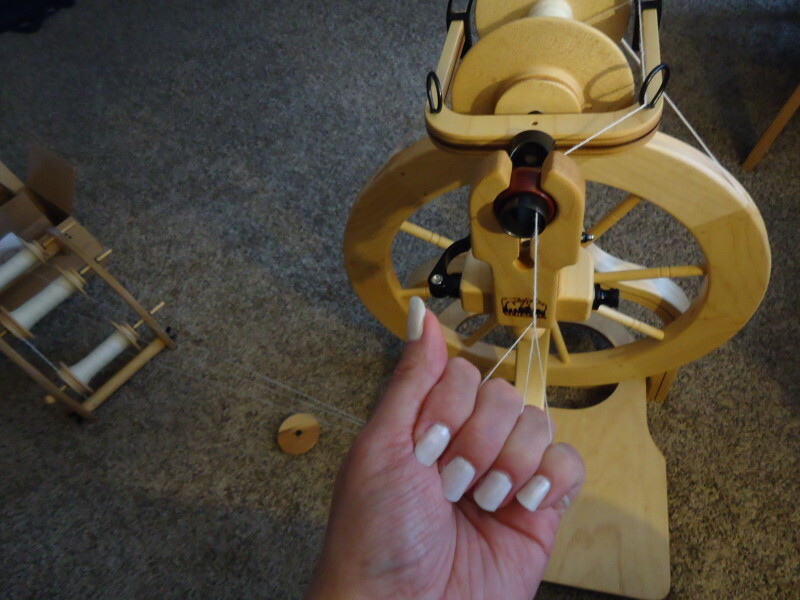 I have read on the Facebook spinning group, several people mention they just keep the bulky/Plyer flyer and bobbin on for spinning regular yarn and plying. This way they have the larger capacity bobbin and spin more yarn before changing bobbins. I find the flyer has a little too much take up for me to do that. Perhaps I tend to spin a finer/thinner yarn than them. I’m certain if I used it to spin my normal singles, it would undoubtedly pull the fiber from my hands. I tend to use very little take up. Camera hand usually pinches yarn to control twist. Plying my yarn went well. I have a fair amount of singles yarn left over on two of my bobbins. I usually fill my bobbins more evenly, but I think I’ll just make a two-ply yarn with what little is left. The singles are finer than I usually spin. It was more difficult to spin my singles evenly, but the yarn looks pretty good. More like my earlier yarn, but still nice and very usable. I really like to keep a control card when I spin. I used to just pull off a ply-back sample strand, but it would eventually get lost, and I might compare it from time to time. Making this card keeps everything together. I can see what the single looks like, two-py, three-ply, count the twist per inch and write it down. Periodically, while I’m plying, I can stop to count my twist per inch to see if I’m on target. I removed the yarn from the bobbin onto a skeiner, through a meter. When I pulled it off the skeiner, there was only the slightest clockwise twist. I gave it a good hot soak with a small squirt of no rinse conditioner in the water. It was like summer yesterday, so I laid it on the table on the deck to let it dry. It has a nice hand, if feels soft, and I like the grist. The skein weighs 57.5 grams/2.03 oz, it has 292.6… yards/267.62 meters. I think that’s enough for a project. I may give this yarn some color, I’ve got enough white yarn around the house as it is. This was made from the Cheviot wool I received when I purchased my wheel. I may make some mittens with it. Of course, mitten weather will be over by the time I’m finished, but I’ll have them for next year 🙂 .